The words “long awaited” are often applied to long winded marketing-speak-riddled descriptions of various follow-ups to pieces of writing, films or other forms of serialisable entertainment. The term usually implies that somewhere vast hoards of ravenous fans are chomping at the bit, queuing for months on end waiting for some product or other to be ready for their growling appetites. So to call “Frank Billions, Chapter Two” long-awaited, while technically accurate, might be construed as misleading, were it to be revealed that the number of individuals who were actually waiting for it is quite small. Very small actually, especially when you take out the various, somewhat lofty, “future” projections of the series’ fan-base. Still, a little bit of marketing hype never hurt anyone, and I’m sure the Internet Police have better things to do than monitor the odd bit of connotative inaccuracy (or overly self-indulgent prologue for that matter). So I’ll do as I please and wear the consequences like a cheap summer hat. For those who missed the opening chapter, it can be found here. The sign out the front of the Asteroid Deli and Cooperage boasted the best damn sandwiches this side of Brendon’s Comet. The sign was true enough, although it was more of a slight on the other sandwich joints than the quality of Asteroids’. Still, you didn’t show your face in this system unless you had the gut to back it up. Like I said, I hadn’t been here in years, but as I walked through the green saloon doors I realised that old Jordan Asteroid never was one for change. The paintwork, the people, even parts of the salad bar looked like they hadn’t moved since the last time I was in. I looked at the old man behind the counter. Time had not been kind to Joran Asteroid. Not that time is ever particularly pleasant to the best of us, but in Jordan Asteroid’s case, time must have held some longstanding grudge. The last time I saw him he was missing an ear and three fingers. He was now down an eye and a few teeth. His missing eye was covered with a black patch and his bad hand had been replaced by a laser hook. 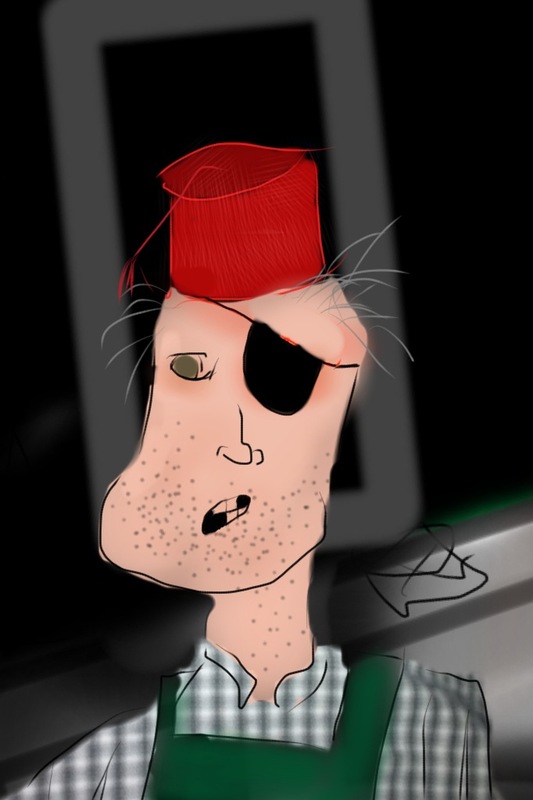 It gave him the appearance of a space-pirate, or it would have done, had he not been wearing ugg boots and a fez. His smile seemed genial, if a little toothless. Evidently the “howdy” had been genuine and the “stranger”, merely jovially ironic. Time had not been kind to Jordan Asteroid. “It’s been a while” he said, nodding at either me or the yoghurt stand, it was hard to tell with one of his eyes missing and the other lazier than an East Galaxy Council worker. It didn’t matter. I got his gist, and I hadn’t come for yoghurt. Like I said, some things never change. You don’t get something for nothing in this neck of the galaxy. I tossed a coin down on the counter. “Give me a turkey on wholegrain.” The old man’s lazy eye swivelled. “He said he needed to go into hiding for a while. I saw him talking to Mad-Duck.” Mad-Duck Mallard was the go-to man for every dirty two-bit crook in these parts. He could get you anything you wanted, for the right price. I was about to ask Jordan where I could find Mad-Duck when a kid in a suit about three sizes too big muscles past and orders two sandwiches and a barrel to go. He must have been twenty-five years old, but swanned in the place like he was the King of Jupiter. “Wait your turn, kid.” I said and turned back to Jordan. The kid hitched his jacket up to reveal a quantum six-shooter in his shoulder holster. “How about you mind your own business, Old-Timer,” he smirked. At one time I would have knocked some sense into a guy like that. I wasn’t afraid of his shooter either. I could have knocked him out cold before his finger touched the trigger. But these days there’s no point. A punk kid like that never learns. It aint worth a stinging fist, not even on a smirk like the one he was giving me. “Maybe Starmatt can send him one of his freight runs.” I glanced down at the pile of newspapers on the counter. Captain Starmatt’s latest deep space incident had made front page news for the past week. One of his biggest freight ships had struck a rogue comet halfway to the Archenar system. “Don’t believe everything you read in the papers.” Asteroid looked as though he was attempting a conspiratorial wink. He gave up after a few minutes and resorted instead to a tap on the side of his nose. Everyone who’s anyone had always known that Captain Starmatt was as crooked as a spacewalk, but his freight business was supposed to be legit, a front for his smuggling rackets, his counterfeit money rackets and his overpriced tennis racket rackets. If Asteroid smelled a rat then I wanted to have a whiff too. “Are you telling me,” I began, but before I could finish there was a small tremor and Jordan’s wife Elfour beamed into the room. Elfour Asteroid was the kind of woman that gave formidable women a bad name. Her old man was a general in the Imperial Galactic Navy and her mother was a stage ventriloquist. Elfour knew what she wanted and nothing short of a mutiny or dummy malfunction would get in her way. She had a voice like a fog horn and a glare that could take the blush out of a red dwarf from about four light years away. Spiral-Arm Magazine had voted her “Top Woman Not To Mess With” every year for the last twenty-four years, ever since she objected to an an unfavourable article about her father’s post-war antics. She retaliated with a particularly pithy letter to the editor, a fairly venomous PR campaign against the publication and an all-out nuclear assault on the moon which housed the printing presses and complaints department of the magazine. Her “three pronged strategy”, as she called it, did the trick and the magazine printed a retraction the following issue. “Hello Frank, you’re not here on business, I hope.” Elfour had a chip on shoulder ever since a case Marty and I were working on ended in a shoot-out at the Deli. The damage had been paid for but Elfour didn’t like us sticking our noses into her joint unless it was for some chow. “Tricks are just fine. We finally made some money from the cooperage this week.” Barrel sales had been in decline for years, and the Asteroid Delicatessen and Cooperage had felt the full brunt of the downturn. Jordan attempted another conspiratorial nose-tap, this time with his other hand, forgetting about the laser hook. The smell of singed nasal hair and cauterised flesh filled the room, but it wasn’t the only thing I smelled. Old Jordan Asteroid was never one for insurance, and he certainly didn’t need to send thirty thousand barrels to the Archenar system. This was a scam, but it wasn’t the only one in this mixed up dirty neck of the galaxy. And unless Martin was mixed up in insurance fraud, I couldn’t give three hoots about what went on between Asteroid and Starmatt. Thanks for reading. I promise Chapter Three will be here in less than two years. F*ckin’ awesome issues here. I am very satisfied to look your post. Thank you a lot and i am looking forward to contact you. Will you please drop me a mail?